Balloons are one of the best ways to cheer up your day. Feeling like a kid is one of the feelings that is free from stress and any kinds of tensions. Colorful balloons please people of all ages. Whether a kid, an adult, or an old-aged person, balloons attract with their colorful and positive look and feel. It is mostly seen that bunch of balloons makes a room colorful. There are so many balloon decoration trends that were used traditionally and are in use even today. 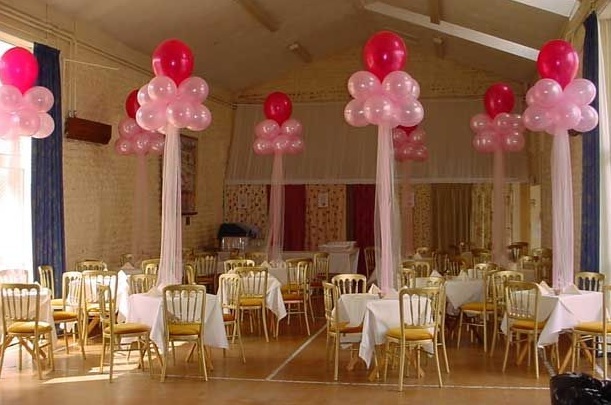 Balloons are a very cost-effective way of decorating any event and adding glamour to it. Everyone loves bunches of colorful balloons that adds colors and life to the event. To get this wheel of charm rolling, we have compiled this list of 10 simple ways to decorate a table with the balloon in a unique way. The first and the most impressive way to decorate your party table is to hand the photos of the guests from the balloon and create a chandelier. Make sure you hand the photos of the guests respective to their seats so that they are aware of their seating area. The second idea is to tie the balloon with the return gifts of your guest and make sure you hang that balloon over the table of the each guest. Then you can place a glowing stick inside the balloons and inflate them. Hang these balloons in bunches over the table and give your tables a new look. Using polka dotted balloons and adding some filler to the back of it. Hang these balloons over the table and surprise your guests in a cost-effective way. Inflate confetti balloons. When decorating the table, add some confetti’s’ to the balloon and inflate them to create a mesmerizing effect over the table. Prepare horizontal pillars and place them near the corners to the tables. Your guests would feel special and they would love your party area more. Inflate colorful balloons of different sizes and make a sleeping line over the boundaries of the table. You can add a central balloon with some confettis or artistic material that can increase the beauty of the center table. You may use same colored or different colors balloons. Create ice-cream balloons. Hanging balloons over the table are one of the best ideas. What if, you create an ice-cream balloon and then hang them over the tables of your guests. Hopefully, this is the best idea to decorate your table in an attractive way. If it is a kids’ party, inflate balloons in the shapes of fruits and vegetables. This balloon decoration idea works best for the kids’ party where they can enjoy seeing fruits and vegetables of different colors. The last but not the least balloon decoration idea can be, inflate donut balloons and decorate your party table. Hopefully, above ideas will inspire you to use balloons as one of the main items to decorate your party table. All of these ideas are very cute and would definitely make your day memorable.